As the total number of contests available at HorseTourneys continues to expand, it’s important to note that contests may be filtered in the “Upcoming Contests” section by category. You may display only the contests under a certain category by clicking on that category in the “Upcoming Contests” header. Various categories are included, including Feeders, Pick & Pray format, certain major events (such as the NHC and HPWS), Head-to-Head and others. 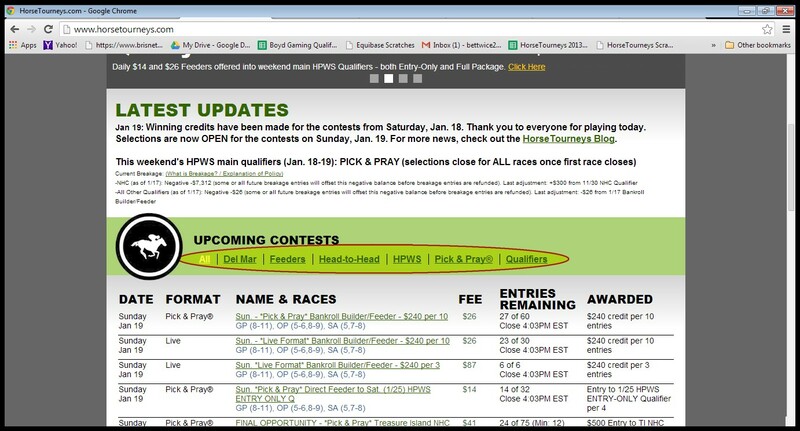 Note that the default “All” category displays all upcoming contests with the exception of Head-to-Head events. Head-to-Head events are only displayed under the Head-to-Head category. Click the screenshot below to see where the categories are highlighted. This entry was posted in Common Questions, Site Features/Improvements by McKay. Bookmark the permalink.